Humans have not been kind to animal migrations. Relentless hunting over a century ago ensured that we will never watch billions of passenger pigeons turn day to night as they pass overhead or hundreds of thousands of bison disappear in clouds of dust as they thunder across the prairie. Today, we risk losing what some consider the most spectacular journey of all – the mutigenerational migration of the monarch butterfly. So many eastern monarchs once congregated in the Mexican forests where they spend the winter that observers likened the sound of their fluttering wings to a rippling stream. Even the much smaller western monarch population once clustered in masses dense enough to break branches on California’s coastal trees. But over the past 20 years, both populations have declined by over 90 percent. And in a classic case of good intentions gone awry, efforts to help the beleaguered butterflies may be inadvertently making matters worse by changing their behavior. Deforestation in Mexico and development along California’s coast have destroyed much of the monarch’s winter habitat. But the widespread loss of breeding habitat -- which for monarchs means milkweed, the only thing their caterpillars eat -- poses a much bigger threat. In the Midwest, where half of Mexico’s overwintering monarchs are born, nearly 60 percent of native milkweeds disappeared, a 2012 study in Insect Conservation and Diversity found, coinciding with increased use of glyphosate, commonly known as Roundup, on expanded plantings of crops genetically altered to tolerate the weed killer. Glyphosate is also widely used in the West. In California, it ranked among the top 10 most used pesticides in 2012 (the last year reported). Its use will likely increase as growers plant more Roundup-ready cotton and alfalfa. 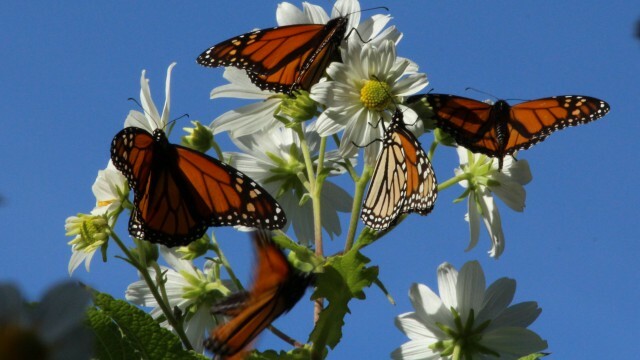 When conservation groups launched campaigns to plant milkweed in gardens, along roadsides and anywhere monarchs might find it, butterfly lovers responded in droves. But scientists fear that some of these good-hearted efforts may be doing more harm than good. That’s because not all milkweed is created equal. Monarchs that migrate are the final generation of summer breeders. Those born before them have one job: reproduce. They lay about 400 eggs within a month, then die. The last generation has a job too: travel thousands of miles to overwintering sites. They’re born in a nonreproductive state to conserve energy for the flight and the five-month wait until spring returns to their breeding grounds. Monarchs coevolved with perennial natives that emerge in spring when monarchs are ready to breed and die back in fall when it’s time to migrate. Tropical milkweed (Asclepias curassavica) is not native to California and doesn’t act like its native counterpart: it’s still going strong when the natives disappear. Because it’s pretty, easy to grow and the most widely available milkweed species in commercial nurseries, it’s become the go-to plant in butterfly gardens. But if butterflies find it out of season and start breeding, recent research shows, they’re giving an old foe – a debilitating protozoan parasite called Ophryocystis elektroscirrha (OE) – the chance to flourish. Adults infected with OE can drop millions of spores on milkweed, which caterpillars ingest along with leaves. Mildly infected monarchs may look fine but can’t fly or reproduce well and die early. Infested larvae may fail to emerge from their chrysalis. 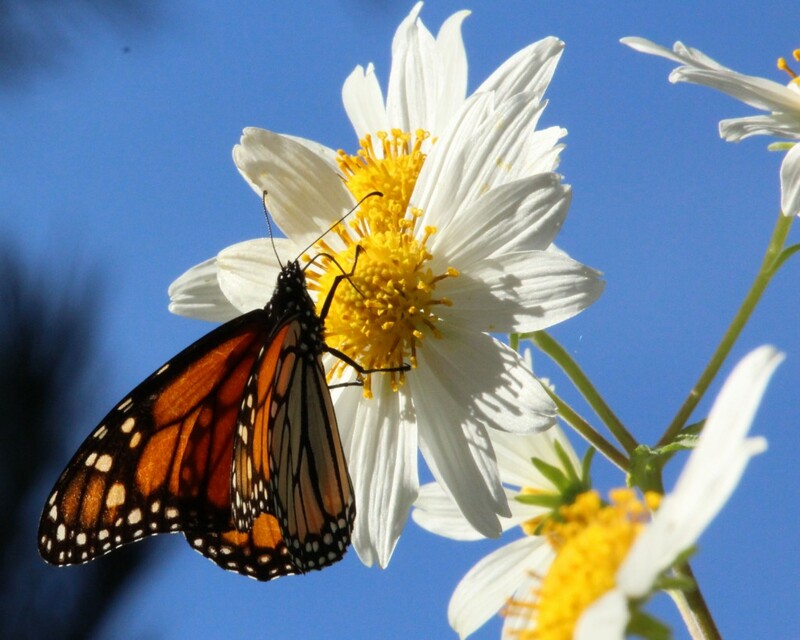 Work by Sonia Altizer, a disease ecologist at the University of Georgia, has shown that when generation after generation of monarchs breed on the same plants along the Gulf Coast, parasite levels can skyrocket. Continuous breeding risks losing what Altizer calls a key benefit of migration: limiting parasite numbers by allowing monarchs to escape contaminated plants. It doesn’t help that monarchs tend to lay far more eggs on tropical milkweed -- typically grown in dense clusters -- thereby exposing more caterpillars. Beyond falling prey to parasites, caterpillars born in winter could freeze during a cold snap. And with females laying so many eggs, caterpillars may starve to death. More than 90 percent of the unseasonal breeding is happening on tropical milkweed in backyard gardens, Villablanca says. He’s trying to figure out if the breeders belong to a previously undetected non-migratory population or if they’re overwintering migrants that cluster in colonies to stay warm at night and then breed during the day. If they’re breeding year-round, disease could pose a dangerous threat to the West’s monarchs, already in serious decline. In preliminary work, Villablanca found higher OE levels in butterflies collected from tropical milkweed gardens than from those sampled at overwintering sites. He worries that monarchs could emerge from these gardens infested and then fly to overwintering sites and spread disease. Still, the drastic declines in milkweed remain the monarch’s biggest threat and scientists are grateful that so many people want to help. 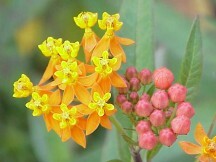 If you have tropical milkweed in your garden, help it behave like a native: cut it back during the fall and winter. Better yet, ask your local native plant society which species are native to your area. Contact the California Native Plant Society to find milkweeds native to your area. The Pollinator Partnership locates native plants by zip code. Pesticides kill monarchs throughout the life cycle. 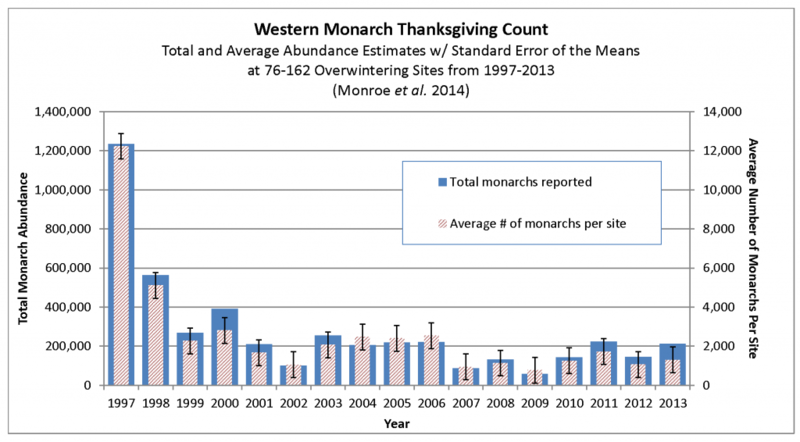 Scientists need data to understand all stages of the monarch's annual cycle. Contact Monarch Joint Venture, Monarch Health or The Xerces Society to find out how you can contribute. You can view overwintering monarchs at the Monarch Grove Sanctuary in Pacific Grove. For more information, see For the Monarch Butterfly, a Long Road Back.